Will kale be (finally) out? Or is it time to move on to other health foods? You’re about to find out! We’ve compiled the hottest natural product trends in 2017 for you, so you can be inspired to try more natural products. PLUS: A chance to Win a $100 Whole Food’s Shopping Spree (details at bottom of post!). 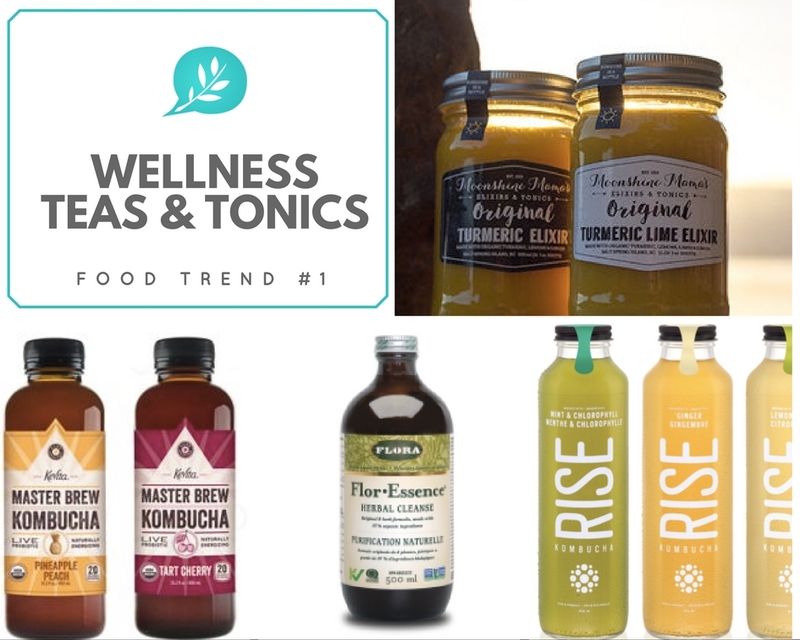 WHAT – In 2017, it’s all about sparkling tonics, fermented teas and healthy-infused beverages containing super-food ingredients like turmeric and apple cider vinegar. WHY – Not only do you get health benefits such as improved digestion, immunity or energy with some of them, they also taste great. TIP – Be sure to check sugar content, as some of them come loaded with natural sugars. If you’re watching calories and trying to cut back on sugar intake, you’ll want to go easy on these. 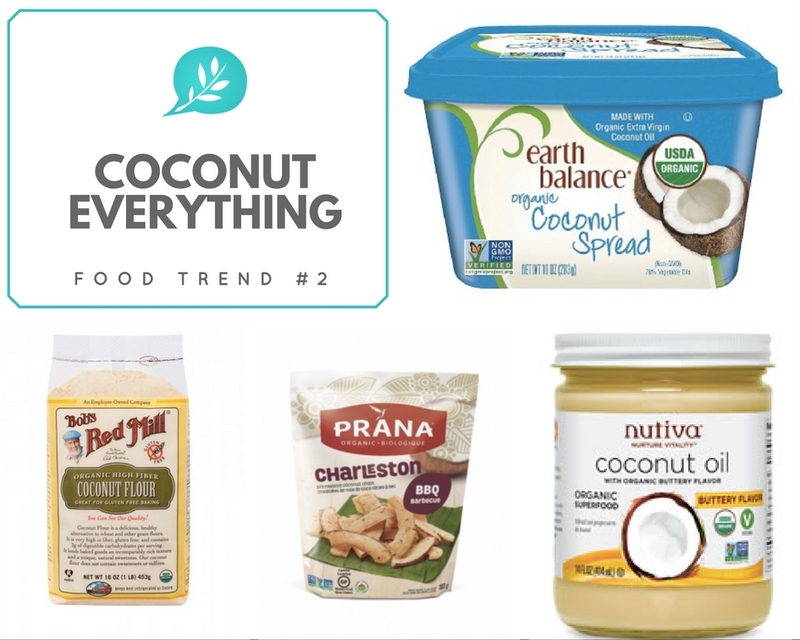 WHAT – Expect to see a ton more of coconut-based products, such as coconut wraps that are lower in carbs, ice creams containing coconut sugar and milk, coconut aminos as a soy-sauce alternative, chips, and coconut-flour baking essentials. WHY – Despite its high calories, the mono-saturated, healthy fat from coconuts doesn’t raise cholesterol levels like other fats and is used by our bodies as energy, which is great for weight management. WHAT – Step aside kale. The new green is actually black! Think seaweed, including fresh and dried kelp, wakame, dulse and nori. WHY – Seaweed not only gives a nice salty flavour, it provides a good source of iodine too, which can be beneficial for thyroid health among other benefits. TIP – Add dulse to stir frys, make salad rolls with seaweed sheets, or top rice bowls with nori for extra flavor. WHAT – Sugar and processed foods are out, fat is in! This is based on the ketone diet which champions fat as the body’s main fuel source, as opposed to carbs. 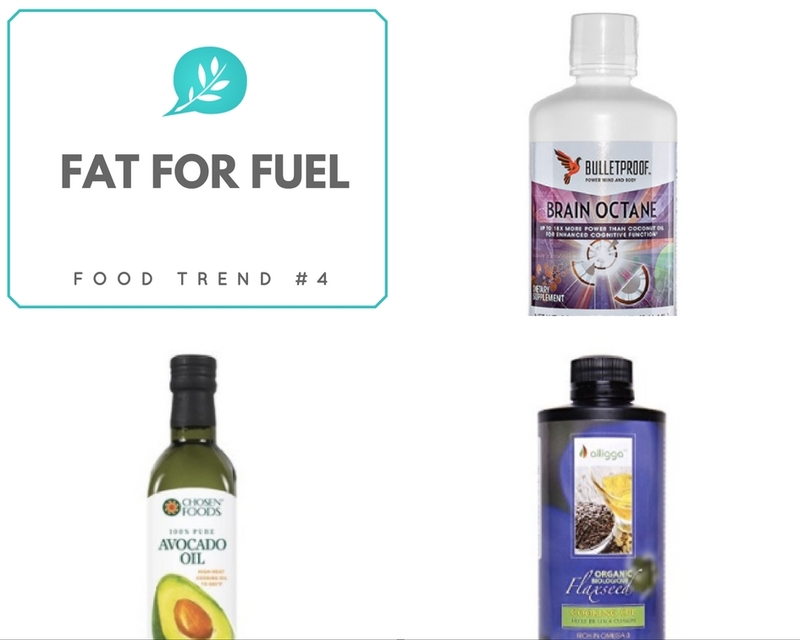 WHY – By introducing more healthy fats into your diet, you feel fuller longer, which means you can cut back on everything else, thereby reducing overall calorie intake, and possibly leading to easier weight loss and/or better weight management. The bulletproof coffee trend (adding grass-fed butter or MCT oil to coffee) jump-started this movement a few years back. Those who follow this regime often report better mental clarity with no crash effects. WHAT – Stores like Whole Foods are now offering purple cauliflower, black rice, purple asparagus, elderberries, acai, purple sweet potatoes, purple corn -even cereal too. 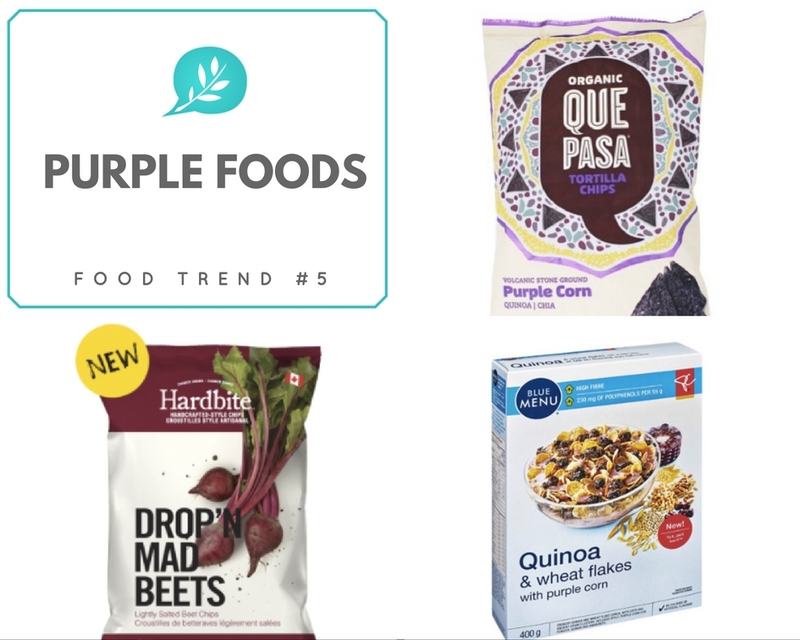 WHY – According to its annual trend advisory compiled by the store’s panel of registered dietitians, purple food is seeing a surge in popularity – and for good reason. The purple color indicates antioxidant and nutrient density. Anthocyanins have been the focus of medical studies for years, looking at how food like blueberries can fight cancer, ageing, and obesity. Plums, for example, are packed with Vitamin C and fibre, while purple potatoes are high in potassium, iron and contain the same antioxidant levels as kale. WHAT – Just like the way our cereal aisle has exploded with tons of varieties, pasta is undergoing a revolution of sorts, mostly due to plant-based, clean-eating movements. 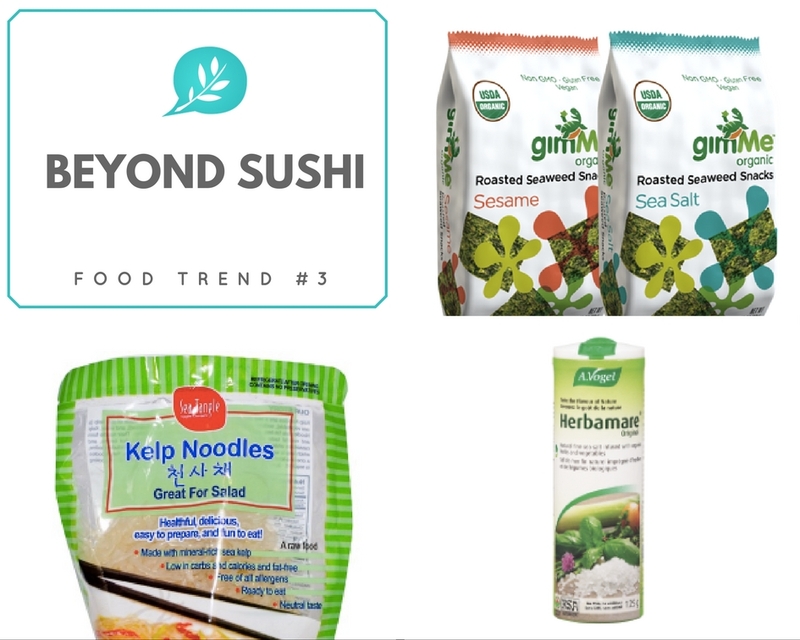 WHY – Alternative grain noodles made from quinoa, lentils and chickpeas (which also happen to be gluten free) are quickly becoming favorites, while grain-free options like spiralized veggies and kelp noodles are also on the rise. 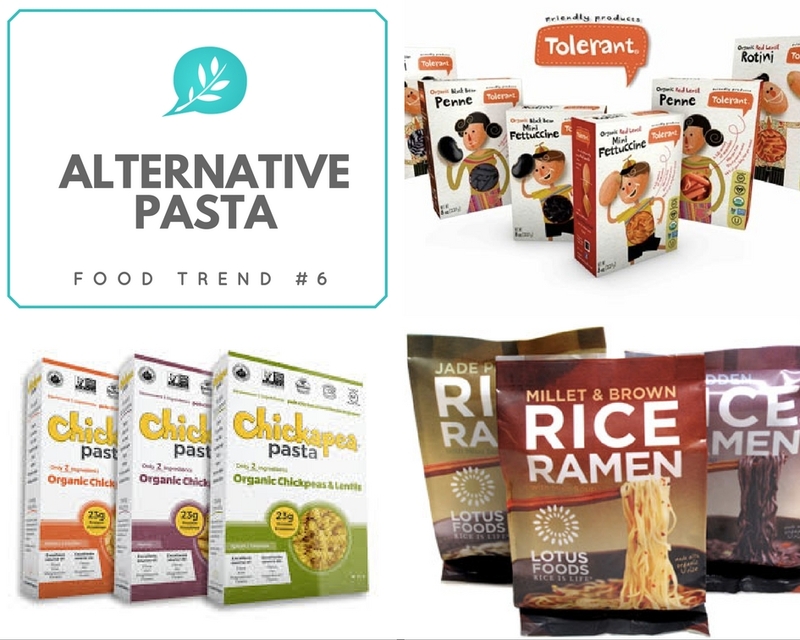 Along with providing a higher source of fiber and protein versus traditional pasta, these alternatives really speak to the millennial generation who follow plant or vegan based diets, care about their ingredients and where they come from. 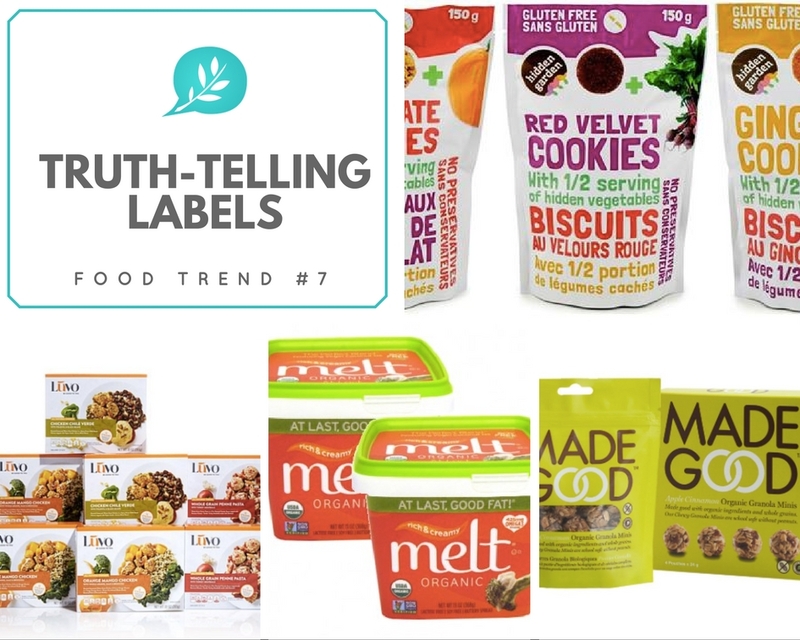 WHAT – Along with seeing cleaner ingredients in many of our products, expect to see more brands using their packaging to tell their story – that is, the what, why, where and how that goes into their food making. WHY – Research has shown consumers – particularly millennials, respond well to companies who have a mission statement or hold values they like. Therefore, the more up-front these companies can be about themselves such as their ingredients and manufacturing- the better. And where better to do this, than right on the label? WHAT – Gone is the idea that protein has to come from an animal. Pea and hemp proteins are popping up everywhere, in protein powders for smoothies, in nutrition bars and now there’s even vegan tuna made from konjac root and pea protein. 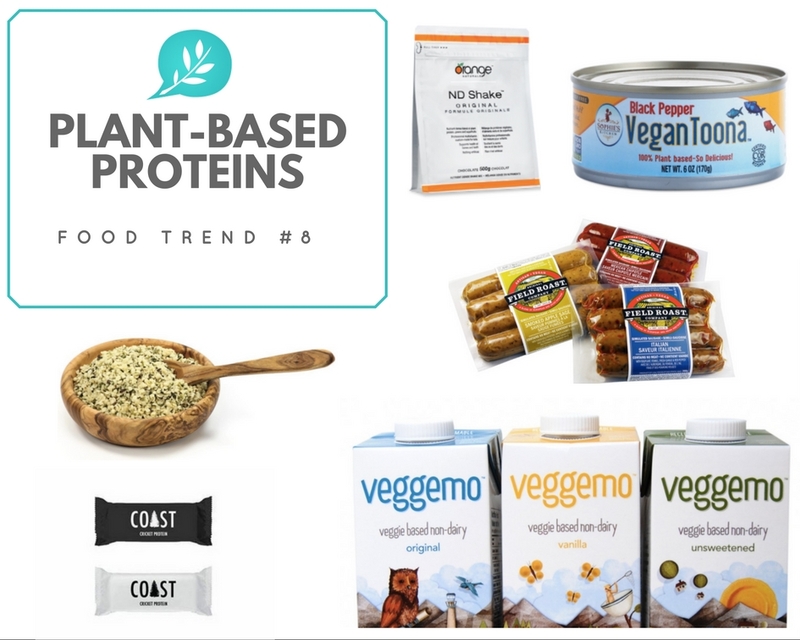 Insect protein is also on the rise with companies like Coast Protein leading the way. WHY – “Millennials are growing this market. They want what’s good for them—but also what’s good for the people and the environment,” says Vega’s founder Brendan Brazier. In the smoothie powder aisle alone, he adds, plant protein is growing 2.5 times faster than whey, and will soon outpace it. This isn’t just a niche market for vegans or athletes either. According to Vega, their research shows that 80 percent of households have meatless Mondays. WHAT – Drop that miracle night creams. Say hello to ingestible collagen – aka, the fibrous protein that holds the secret to glowing skin—not to mention shiny hair, strong nails, and healthy digestion. WHY – Consumers are becoming educated about the importance of a long-term approach by beautifying and nourishing from within, versus short-term solutions provided by topicals. What’s more, after the age of 25 we are less efficient at making collagen, so the body has to get it elsewhere. Sagging skin is just one indicator you’re losing collagen, and unfortunately, the Western diet offers up few such opportunities. Cue the bone broth boom—and its new grab-and-go versions (via brands like Boned) and on-the-go bars from Bulletproof and Primal Kitchen. Collagen-rich powders and supplements are also booming, and will continue to in 2017. TIP – Simply add a serving to your morning smoothie or any liquid, and drink-up. 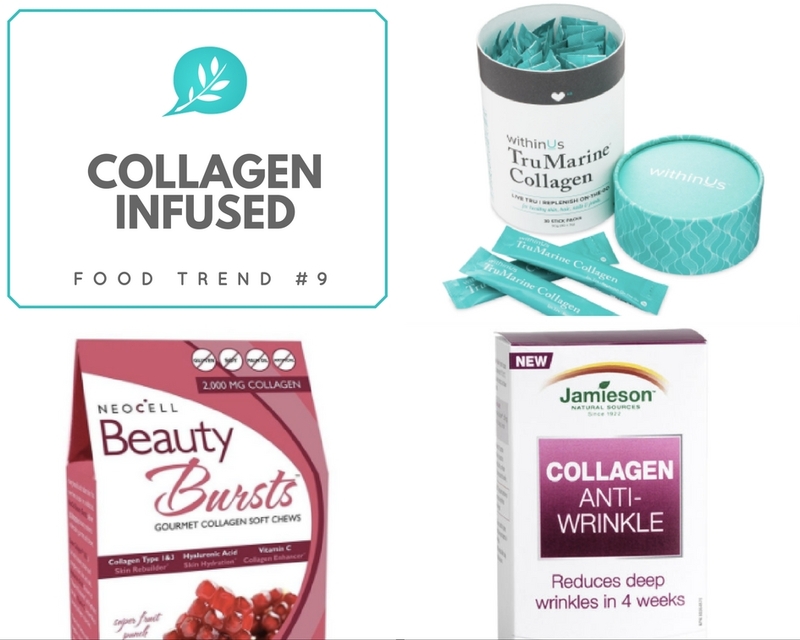 The ultimate sign that collagen is about to go big? It’s a staple in Jennifer Aniston’s daily smoothie. WHAT – Whereas before the hot healthy topics were weight loss or energy, now it’s all about gut health! And it’s only getting started. 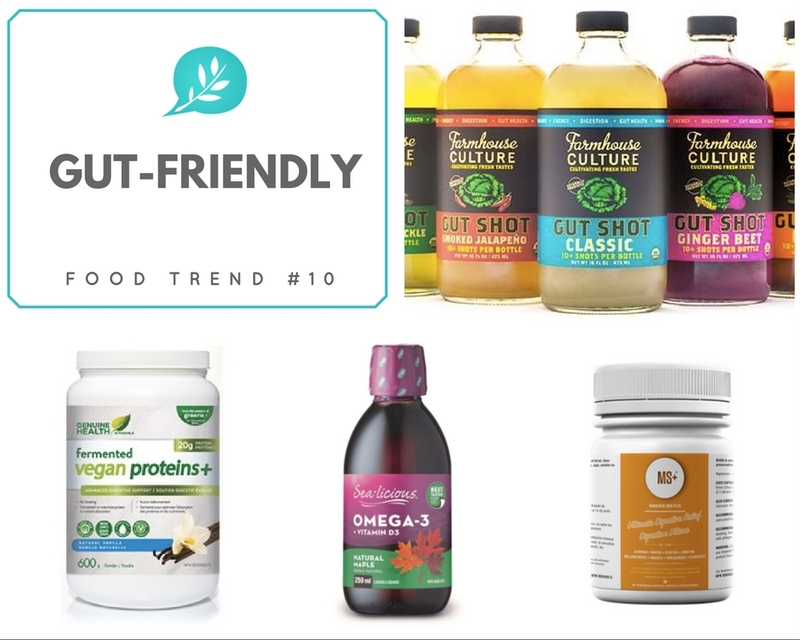 WHY – With more and more research showing the state of our gut can be linked to food allergies, immunity, mood, weight – even our memory, you can see why companies are jumping on the opportunity to make ‘gut friendly’ products. From probiotics to protein powders, supplements to beverages, expect to see lots and lots of products on shelves in addition to Kefirs and Sauerkrauts. WHAT – Sugar’s bad rap continues to make headlines. 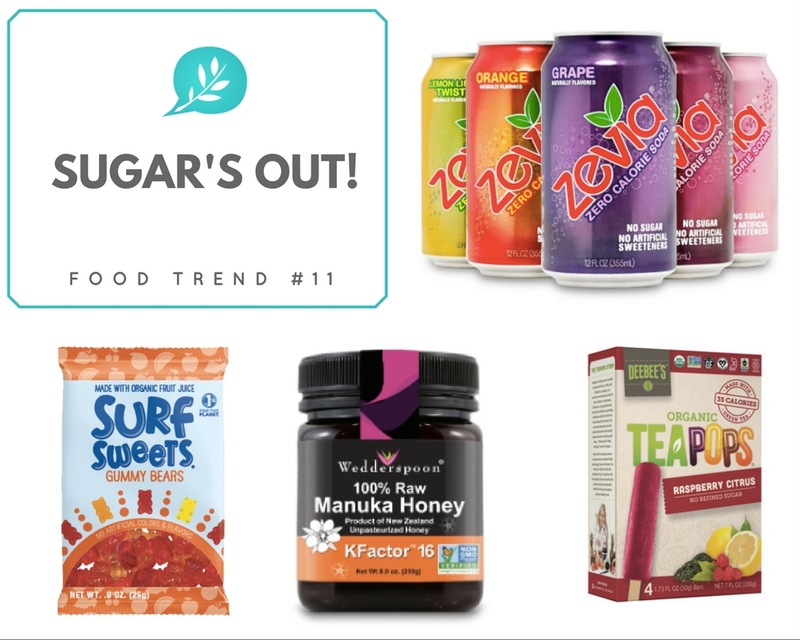 And in 2017, we’ll see more and more food companies jumping to reduce and/or replace the sugar in their products. WHY – Besides its link to our obesity epidemic, sugar has been shown to be more addictive than cocaine! This is according to research published in the Public Library of Science based on a strange lab rat experiment. In it, rats were given cocaine until they became dependent on it. Soon following, researchers gave them a choice: they could continue to have cocaine or they could switch to sugar. Guess which one they chose? 94% chose sugar – despite the fact they had to work hard to get it! 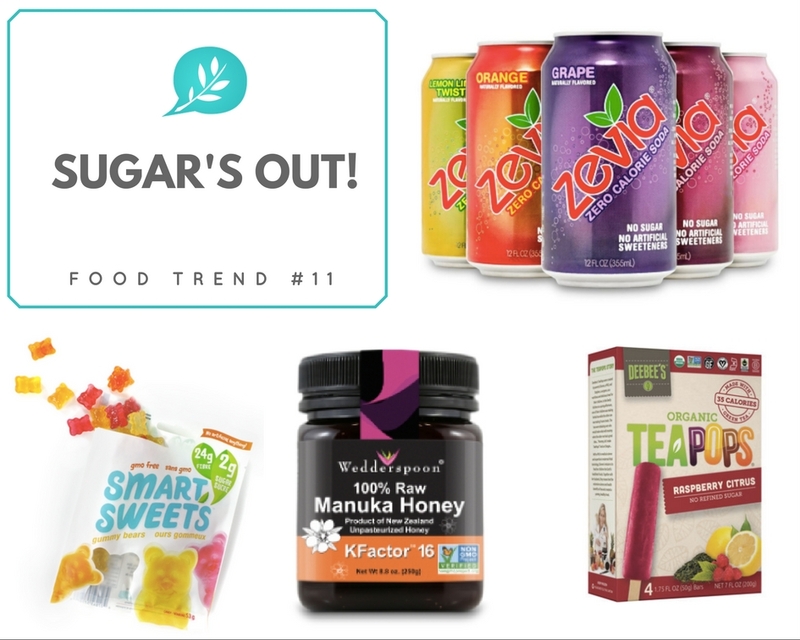 WHO – Companies like Coca Cola are answering the call, as evident from their latest Coco Cola Life – like the original Coke, only it contains the natural sweetener stevia to reduce calories and sugar content. Many health food companies are now also using monk fruit, erythritol and xylitol in their products. Winner will be announced Jan 31st on our social media channels. ← Natural gift guide for Wellness Lovers + WIN our favorite gift!